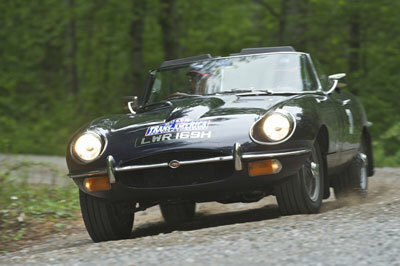 The Endurance Rally Association > Trans-America 2012 > Reports & Results > 02 Frederick to V.I.R. An earlier start today as crews began to leave the Hampton Hotel at 7.01am. Last night’s rain had stopped but the air was still damp and a mist hung over the fields as we pulled out towards the South West. After a short freeway section it was straight up onto the Skyline Drive for a 105 mile (35mph) scenic extravaganza through the Shenandoah National Park. For the early starters though many of the undoubtedly fine views offered by this route were obscured by dense cloud and fog. It's hard to exaggerate though the quality of the Tarmac as the road swooped through the trees gaining and losing height from one set of bends to the next. Most sang the praises of the route however the Volvo crew of Nicholas Pryor and Lesley Stockwell found the drive particularly tough as they coped with almost non-existent brakes. Coffee and a bowl of chilli at the Montebello mid-morning PC led the rally straight into the first timed regularity section at Panther Falls. Smooth graded gravel took us down to a sharp left hand turn as once more we ducked and dived our way through dense forest. Fully expecting to encounter our first bears this section went on for 11 glorious miles and saw the Eagle Engineered E Type of Phil Garratt and Kieron Brown move into the lead with a well-judged effort. Once again the weather gods chose not to favour us and from the end of the Panther Falls section to the VIR we all got a good soaking. At the VIR a circuit consistency test gave the crews a chance to change up a gear and to stretch their legs enjoying several laps on the beautifully cambered and engineered raceway. At the end of a long but satisfying day most crews sat down to a very welcome beef salad buffet and a few beers while the Mercedes of Herman Layher and Michaela Zingerle was being worked on by the sweep crews trying to plug a punctured fuel tank. Other incidents of note from the day’s activities include a broken clutch for Terry Ward - Geoff Nicholls powerful Mercedes 450. They've had to lay up for the night and will rejoin the Rally as soon as they can. 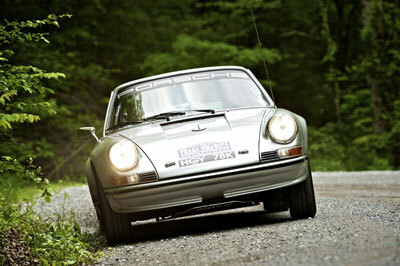 Steve Hyde and Janet Lynne in the Porsche survived a warning light scare on the VIR. Once they'd pitted they discovered that the auxiliary belt had become detached but it was an easy fix for the sweep crews to deal with. Tonight we stayed at the Virginia International Raceway as tomorrow there are more tests on the circuit before we head further west to Knoxville, Tennessee.